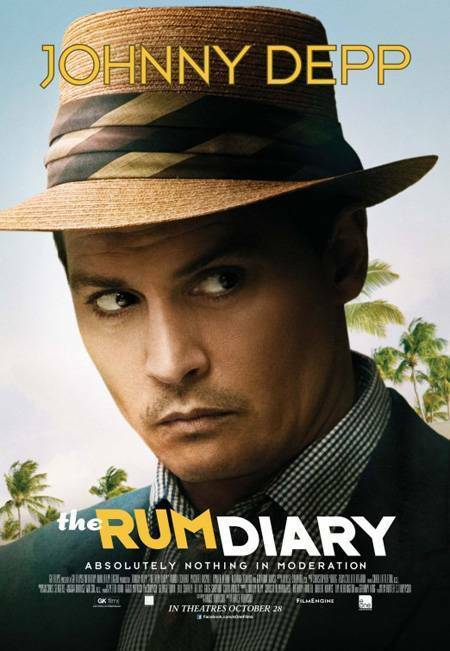 The Rum Diary, the long-awaited follow-up to Fear & Loathing in Las Vegas, follows the story of freelance journalist Paul Kemp (Johnny Depp) as he takes on a job at a Puerto Rican newspaper and embarks on a series of misadventures involving drugs, corrupt businessmen, and cockfighting. As he gets deeper into the world of the island’s residents, the seeds are sown for his brand of rebellious journalism, written for the purpose of exposing “the Bastards.” Through the success of Fear & Loathing there has been a romanticizing of Hunter S. Thompson’s work by many in our generation, so needless to say The Rum Diary came with much anticipation. Judging by the sold-out, diverse audience who attended the premiere, it’s safe to say that the thirteen years since Fear & Loathing have only grown the hype. So, was the latest entry worth the wait? I’d say so. Johnny Depp looks very comfortable in the role, delivering his lines and facial expressions with incredible ease. Managing to be both funny and dramatic, it’s clear that he was made for roles like this, and in The Rum Diary he is supported by a strong cast of characters that include Aaron Eckhardt to Giovanni Ribisi. The script from director Bruce Robinson features everything you’d expect, from adventure to drug abuse to quirky (and often meaningful) dialogue. There are some truly memorable scenes that are bound to stay with the viewer for a long time, such as Johnny Depp breathing fire and a hilarious car chase sequence. The film is definitely worth a look for fans of Hunter S. Thompson, Johnny Depp or Fear & Loathing. The Rum Diary opens today in Philly-area theaters.